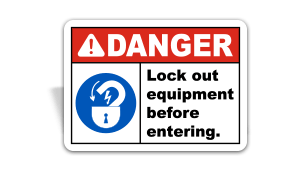 Lockout/Tagout (LOTO) is a safety procedure used to ensure machines and equipment are properly shut off and kept off during the completion of any maintenance or service work. The OSHA defined standards on Lockout Devices provides the minimum requirements for the control of hazardous energy during “the servicing and maintenance of machines and equipment” where unexpected energization could harm employees. In other words, proper lockout/tagout measures alert personnel that certain pieces of equipment have been temporarily disabled for their safety. When unexpected startup or the release of stored energy could result in an injury to those performing service or maintenance on or around a machine. When your facility receives new equipment or machinery and it’s being installed. When a guard or other safety device must be bypassed or removed. When an employee is working on moving machinery and they must place any part of their body in/or near the moving part. Electrical Plug Lockout – This device works by surrounding the electrical plug and protecting employees against the accidental and unwanted reconnection. Lockout Safety Padlock – Padlocks are lockout devices that are designed to prevent others from disabling an energy isolating device. Circuit Breaker Lockout – Designed to isolate a given breaker in a circuit breaker panel so that the entire breaker box does not need to be locked out. Lockout Hasps – Allows more than one worker to put their padlock on a lockout device when more than one worker is performing maintenance on a given piece of equipment.